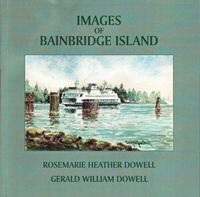 Artists Rosemarie and Gerald Dowell collaborated on a book with the title Images of Bainbridge (2000). Rosemarie Dowell's poetry and pen & ink drawings are complemented by her husband's water colors. Poems and art both reference various points on the island - among them the Eagle Harbor waterfront, Pegasus coffeehouse, Gazzam Lake, and the Christmas Tree Farm. Harriet Alexander from the Bainbridge Island Arts and Humanities Council says of the book: "There are many kinds of love affairs. Love for artistry, love for each other, and love for a place are the ones you will find in this collection."